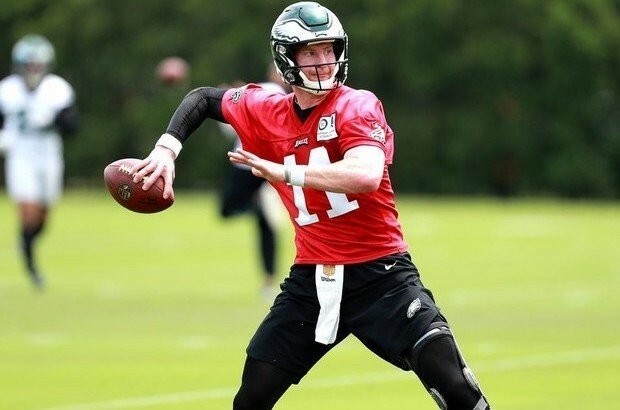 There had been a report by ESPN that Eagles quarterback Carson Wentz would be on the team’s Physically Unable to Perform or PUP list, but he wasn’t. Unfortunately due to injuries, there were five Eagles who did wind up on the PUP list and they are defensive end Brandon Graham, wide receiver Alshon Jeffery, defensive tackle Tim Jernigan, safety and special teams ace Chris Maragos, and wide receiver Bryce Treggs. The Graham injury snuck up on a lot of people because he played through it during the playoffs and Super Bowl. Despite the injury he was able to make the defensive play of the game when he stripped Tom Brady of the football with the game on the line. The injury occurred when the affable Graham twisted his ankle on Christmas night in the Eagles victory over the Oakland Raiders. Jeffery played most of last season with a torn rotator cuff and despite the injury was able to make remarkable catches with his arms extended. He made the first score of the game when he extended his arms to snag a Nick Foles pass early in the Super Bowl. We haven’t been told when the team expects him to return to action. Jernigan who is teamed with Fletcher Cox in the middle of the Eagles defensive line suffered a very dangerous back injury during the off season. A back injury to a defensive linemen concerns me very much because the medical community doesn’t seem to have mastered back surgeries. Hopefully Jernigan returns to action at some point this season. Maragos tore a ligament in his knee during last year’s game against Carolina. He’s expected to return to action at some point prior to the season. He’s a key member of the Birds special teams. We were also surprised to find Treggs on this injury list because nobody knew he was injured. We still don’t know what is keeping him out of action. FOOTBALL IS OFFICALLY BACK BABY!! First time in our history we can defend that trophy!! The goal is to have him ready for November December, and the next 10-15 years. Jernigan can take all the time needs in the world to recover. Especially with this rotational defensive system. Josh sweat, Ngata, Elijah, Destiny should sure up the middle of that defensive line. I know josh is a pass rusher, but he’s still depth. I think the Eagles have a good chance to repeat. 12-4 is a reasonable expectation. Agree with you there Cliff.